a) Healing efficiency is obtained by fracture toughness testing of tapered double-cantilever beam (TDCB) specimens. 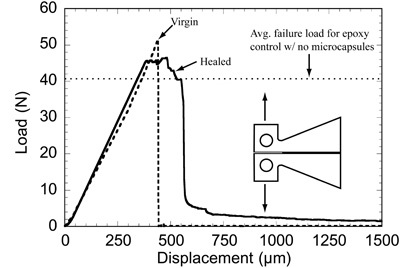 The virgin fracture toughness is determined by propagating the starter crack along the mid-plane of the specimen. Subsequently, the load is removed and the crack allowed to heal at room temperature with no manual intervention. The healed fracture toughness is then measured by retesting the specimen. The healing efficiency for this sample with 2.5wt% Grubbs’ catalyst and 5wt% UF microcapsules (DCPD core) was 90.3% after 48h healing at room temperature. b) Post-fracture analysis of the specimens revealed that the healed crack failed in an interfacial manner from one side of the epoxy/poly(DCPD) interface to the other. 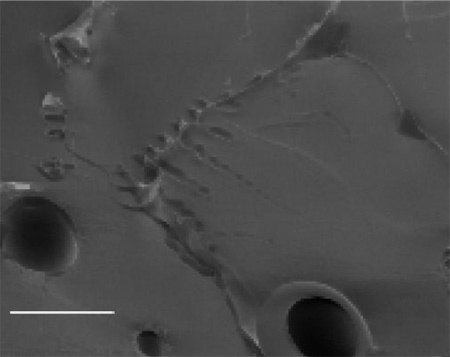 The ESEM image in b shows one area of the fracture plane of a healed specimen in which the poly(DCPD) film is still attached to the interface on the right side of the image. The film that originally covered the interface on the left side of the image is found on the opposite mating surface of the specimen.